Well the gacha didn't gain much traction so I figured I'd just make it a regular old adopt. Edit;; I changed Matte Grey Pearl’s design and removed the sold adopts, so buyers can clearly see which ones are leftwithout distraction! Here’s a stashe link to the original image, your already purchased characters are here! I use PayPal, and I may be willing to take points, it really depends on how many people ask. 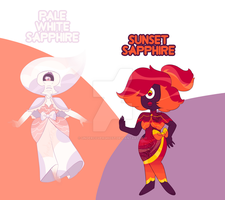 You can change your gem however you like as long as she at least somewhat resembles her original design. You must tag me the first time you draw her. Can I get coral pearl? Hi! Yes, send the money and she’s all yours! Sorry it took me a bit to respond by the way, my charger died and I wasn’t able to log in! So sorry! It happens, you're alright! Sent! Thank you, she’s all yours! I hope you enjoy her! AHHHHH YOURE SO CUTE! YES! CloudySoda bought the Ruby for you!! Thank you as well! I hope you like heeeerrr! I REALLY like how you designed that Coral Peal, Purple and Pink Des!! Hope they all go to good hooomes!! Can I have Seafoam Peridot? Thanks! Man I love all these adopts <3 You did so good on the designs! Thank YOU! AHhhh thank you! o I had so much fun making them!